Mechanical engineers study snakes' sophisticated frictional properties to build more nimble rescue robots. Snakes! Love them or hate them, everyone can agree they are superb at sliding over complex terrain. Learning the slithery reptiles' tricks can provide valuable tips for designing rescue robots to help locate survivors trapped in rubble after a major disaster strikes. Studying movies of the snakes in action, mechanical engineers have applied the way that the animals use friction to build robots that are better able to climb and hold on to surfaces. Hamid Marvi, a graduate student in mechanical engineering at the Georgia Institute of Technology in Atlanta, definitely falls into the "love snakes" camp. "[Snakes are] very cute and very easy to work with," Marvi said. Marvi and his colleagues have designed snake-inspired robots by studying live snakes. Snakes cannot move without friction. When snakes are placed on a very smooth surface, with little friction, they slither wildly but cannot get anywhere. "Snakes can generate waves but they cannot move forward," Marvi said. Instead, snakes move through the use of friction. Snakes’ bodies create friction in different directions -- less friction towards the front of the body than towards the back of the body in order to move forward. Snakes use friction even when they are sleeping -- which is handy for preventing themselves from falling if you try to tilt it on a plane. The texture of their scales, and the way that the scales are arranged -- which can resemble venetian blinds on top of each other -- create this passive friction. When they are awake, snakes generate at least twice as much friction, Marvi said, demonstrating that they consciously use friction to their advantage in navigating environments. 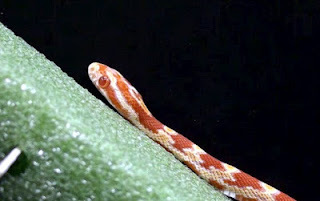 Snakes actively adjust their friction, Marvi explained, by modifying the relative angle between their scales and the surface, to adjust the levels of friction according to their needs. Marvi and his colleagues adopted these principles to create Scalybot, an artificial robot designed to climb inclined planes. Scalybot contains scale-like teeth along the bottom of its body, and these teeth can raise or lower depending on what it needs to do to navigate the environment. Presenting their results at a meeting of the American Physical Society in Boston, Marvi showed video of the Scalybot moving up a plane with a ruler marking its distance underneath it. Since developing the first robot, they have built a more advanced model, called Scalybot2, that has a built in acceleration sensor to help monitor its movements, and separately, its scales can sweep through many possible angles until the robot finds the right amount of grip. The goal of the team, Marvi said, is to help robot designers build machines that are not only more capable in moving through complex environments, but are also more energy efficient in their motions. Snakes' use of friction "has been known for some time," said Bruce Young, an expert on snakes at the University of Massachusetts at Lowell. "It's part of our basic understanding of snake locomotion. What's really interesting about their work is its application to robotics." The way in which the researchers' robotic system "actively alters its friction at key points is an interesting concept," said Young, and could potentially help robots move more efficiently as well as increase the applicability of robots so that they are able to do more things. Mystical Sound, Physics Phenomenon, or Both?